I’m slowly getting the hang of dressing for work. I finally used my birthday J. Crew gift card over the weekend to get a tissue turtleneck. I can already tell it’ll be great for work and weekends. 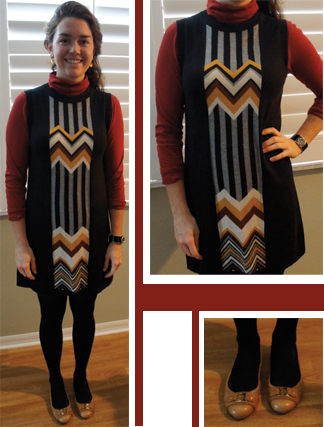 I love layering it under dresses to expand my wardrobe into the fall and winter, especially my Missoni for Target sweater dress. The dress looks great! I hope your enjoying your time as an intern? Brenna you look amazing. Great outfit. I’m enjoying your blog – it’s great that you post almost every day! Thank you, Nora! And thanks for reading.